As the golden sun rose above the crest of the Indian Ocean one beautiful spring morning, Jessica Beacom accepted Philip Boyd’s heartfelt proposal and their lives changed forever. This beautiful scene transformed into a truly wonderful wedding almost a year later, when the pair were wed at Lisbellaw Presbyterian Church, on April 20, 2018 during a ceremony performed by Reverend Rodney Beacom, who is the father-of-thebride, assisted by Pastor Harry Dowds. 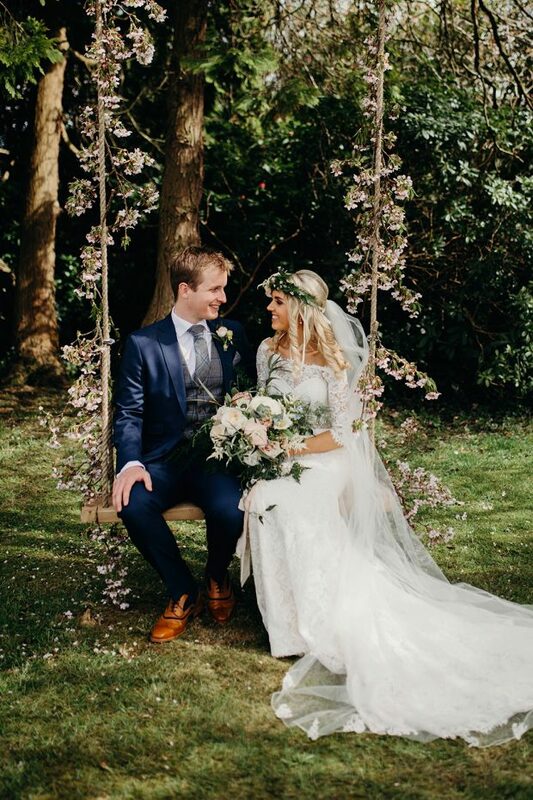 Their wedding reception took place at Solis Lough Eske Castle in Donegal – a castle of character, set beautifully into the Bluestack Mountains by the water’s edge complimented by helpful and efficient staff. Jessica, who is an orthoptist working within the South Eastern Trust from Lisbellaw, recalled always knowing of Philip, who is a technology and design teacher from Clogher. 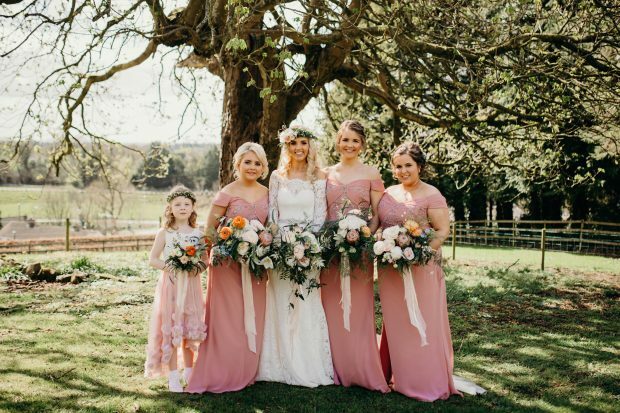 Bride Jessica Boyd (née Beacom), alongside maid of honour, Katie Beacom, bridesmaids Sheryl Boyd and Naomi Watt and Lilly Ella Elliot. However they formally met when they crossed paths during a mutual friend’s 18th birthday party. After spending sometime messaging via Facebook, the pair then exchanged numbers and decided to meet up for a special dinner date while Jessica was home during Easter break in her first year of university. The newlyweds, Jessica and Philip Boyd alongside their loved ones. 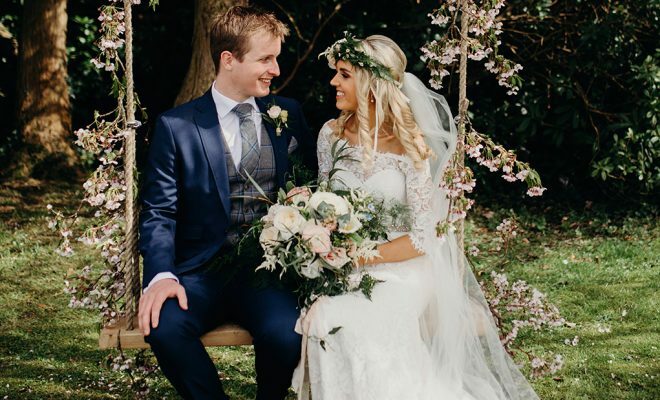 As the couple had spoken of marriage many times before they were engaged, they had a fair idea of what they wanted their big day to be like, and they got stuck into the planning when they returned home from South Africa. “We had always talked about the idea of a vintage and rustic wedding, so on our day we included a vintage bicycle; vintage cars; creamery can; painted crates and jam jars among other personal elements,” Jessica said. Philip, son of Walter and Sandra Boyd, wed Jessica, daughter of Rodney and Laura Beacom in April. Happily the wet and windy weather in the days leading up to Jessica’s wedding ceased, and on her big day the sun shone and the skies were a deep blue. “It was so exciting and lovely to see everything coming together so perfectly after all the planning,” Jessica said. 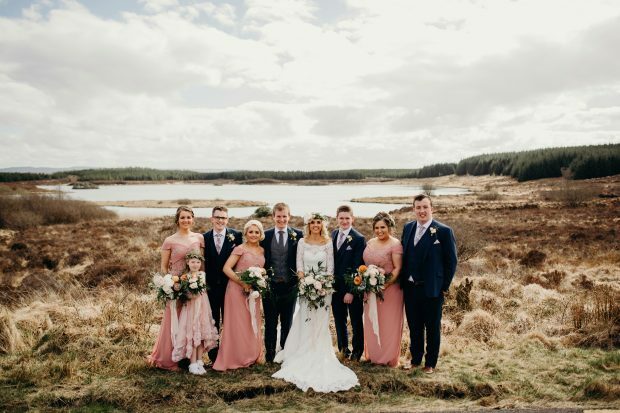 As committed Christians, the service was the most important part of the day for Jessica and Philip, and it was made even more special as it was the Fermanagh woman’s father who wed them. 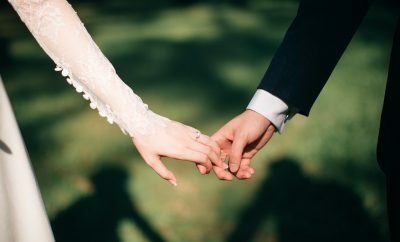 The couple’s hymns included ‘Love Divine’, ‘My Heart Is Filled With Thankfulness’ and ‘Here Is Love Vast As The Ocean’ and their two scripture readings were Ephesians 3:14-21 and 1st John 4:7-21. 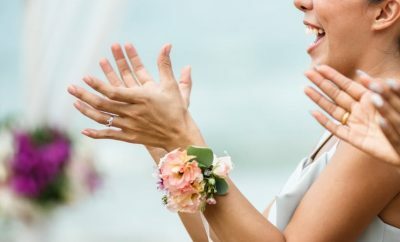 “We wanted our wedding day to honour and glorify God our Saviour, and therefore a lot of attention was given to the planning of the service,” Jessica explained. 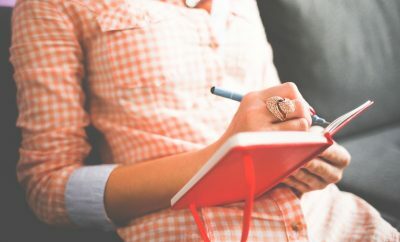 “We felt both the hymns and Bible references conveyed the message of love that Christ has for us and His church, and reminded us of all that He accomplished when He died and rose again for our salvation. 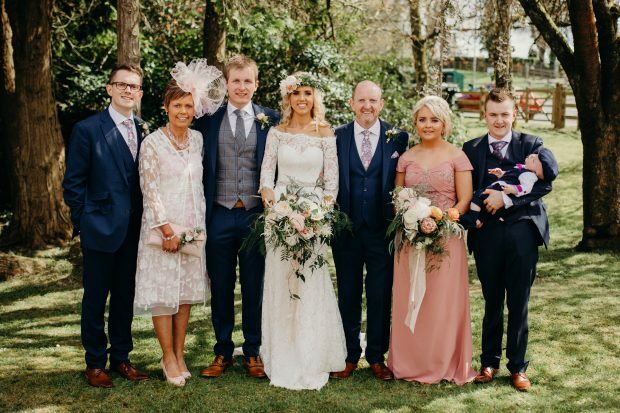 “As my dad was the minister, it was very special to have him not only walk me up the aisle but also to marry me to my best friend – not everyone has that privilege!” Jessica added. “It was also quite emotional when I met Philip at the top of the aisle. It was a very special moment for both of us to be joined together as man and wife. “We are very thankful to God most importantly for saving us, but also for bringing us together and leading us to where we are today. The newlyweds, Jessica and Philip Beacom alongside their maid of honour, Katie Beacom, best man, Kyle Boyd, bridesmaids Sheryl Boyd and Naomi Watt and groomsmen, Jamie Beacom and Matthew Keys. 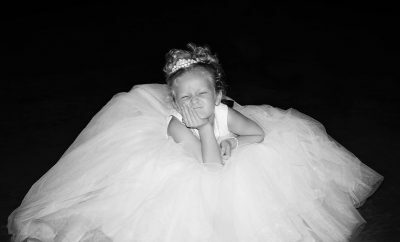 Wedding dress: Serendipity Bridal Boutique, Fivemiletown. Hair stylist/salon: Danibelle Wedding Hair. Make-up: By Kerri Professional Make-up Artist. 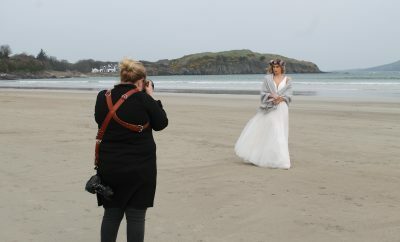 Head piece/ Veil: Serendipity Bridal Boutique, Fivemiletown. Bridesmaid dresses: Serendipity Bridal Boutique, Fivemiletown. 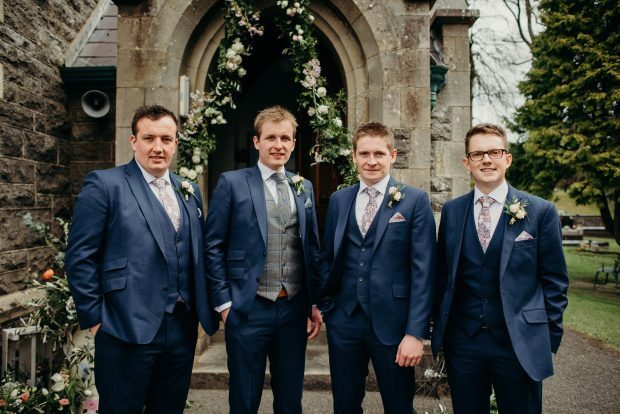 Groom’s/groomsmen’s suits: SD Kells, Enniskillen. Cake supplier: Mary Cashel, family friend. Cake: Four-tiered iced cake with a fresh flower garland, set onto a wooden log which was engraved and decorated with moss. Cake flavours: Fruit; lemon; chocolate; Victoria sponge. Florist: Flowers by Ruth Hood. Church: Lisbellaw Presbyterian Church, Fermanagh. Minister: Reverend Rodney Beacom (father-of-the-bride), assisted by Pastor Harry Dowds. 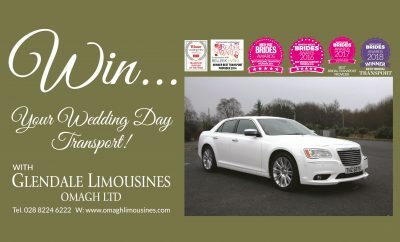 Transport: I Do Wedding Cars. 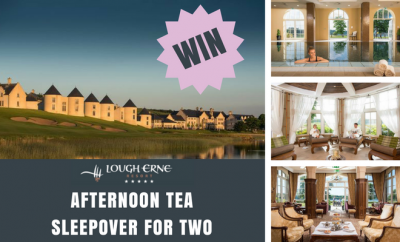 Reception: Solis Lough Eske Castle, Donegal. Number of guests at reception: 180. First dance song: ‘God’s Plan’ by Derek Ryan. Honeymoon: Amalfi Coast, Italy for five days; Route 66 in the USA for three weeks.